It rained last night, and will be cooler and rainy today. Mom opened the front porch for me, and I have been sitting on the porch checking everything out. Mom spent a lot of yesterday in the garden, planting more stuff. She says the shade garden is all planted. She put some of her "extra" plants in pots to decorate the entrance to the yard. Watching her sweat makes me glad I'm a cat. First of all, a correction. Both the front porch, and the office, face East, not South. Mom can't understand why I sit in the kitty condo in the morning instead of the front porch. I do go on the front porch in the morning, I just don't STAY there. Mom thinks that will change as we get closer to Summer and the weather warms up. Mom got more plants yesterday. Her shade garden is coming along, and she is happy with it. This weekend marks the beginning of the garden season here in New Hampster. We shouldn't have any more frosts until September. With a screened in porch that faces South, Mom thought I would like to be camped out there in the morning when it is sunny. Maybe someday Mom will understand that Napping and Watching are two separate activities. None of Mom's quilts is done until I do my QA check. It's a tough job, covering each quilt with my furs, but it has to be done. I also check for love, kindness, softness and cuddle-ability. Mom's quilts always pass. Mom said a chipmunk came to visit while she was working in the garden yesterday, but I was more excited to see a butterfly on the Azalea bushes. Mom's watching tennis and sewing. I'm napping on my kitty condo. I hope you are having a nice day too. Mom got up yesterday, got dressed, cooked herself breakfast (don't worry about me, I -ALWAYS- get my foods first thing in the morning before Mom does anything else), and then went food hunting. When she got back, she planted two big pots of plants that attract hummingbirds. (There is one fuchsia plant, two dragonwing begonias, two coleus plants and one ipo-something.) One is in the middle of the front garden, the other is near the side house, so I will be able to watch hummingbirds eat from the flowers. After that, Mom went to the hardware store and bought bricks. I kid you not. Then she went BACK to the hardware store to buy a gas grill. Then she went to the food store again to buy some real life dead BEEF steak too cook on said grill. Did I get any? These are some of the reasons I did not post yesterday. Fair warning: Today the tennis starts in Paris, at Roland Garros. It's going to be all tennis all the time here for the next couple of weeks. Weasley Needs a New Home! 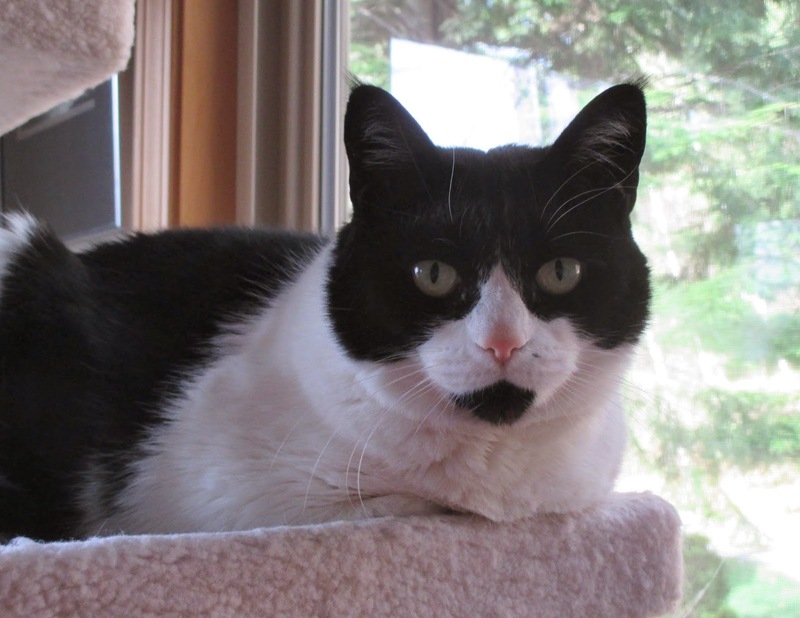 To all my furriends in the Cat Blogosphere, I need your help. My Mom's quilting buddy, Teresa is implementing the M-word and her cat Weasley, can't go with her. He needs a new home near Ypsilanti Michigan. You can read about Weasley here. Can you help me spread the word? Weasley is nine years old, and has been de-clawed. He is friendly and loves to nap and purr. 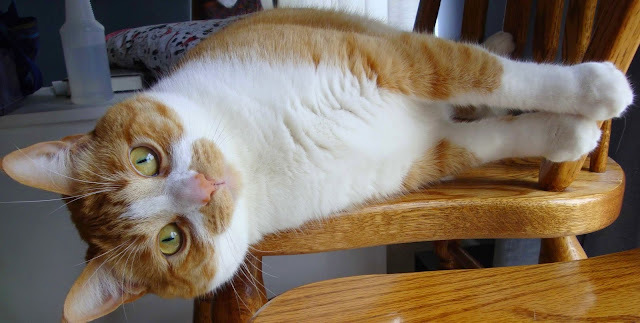 If you know anybody who would like a lovable Ginger boy, please visit Teresa's blog. Weasley looks like a cute boy, and I hope he finds a good home. Thank you for helping out. Mom was lazy last night. She came home from day hunting, lay down on the couch and yakked with her friend from Catifornia last night for almost an hour. Then she made dinner and watched TV. Tomorrow she says some guys are coming to work in the yard, getting the dirt ready for her "shade garden." Mom is very eager to get those plants in the ground. This weekend is the traditional "last frost date" and after this, pretty much everything can be planted. I am on the porch on my new pink hammick. I like it better in the corner. I can see more stuff, so Mom moved it. Where are you hiding out this Wednesday? Labels: cat hammick, front porch, where's Millie? It's raining today, so no garden work for Mom today. Last night she paid the Mr Bills and did some other chores. I did manage to pin her down to get some scritches. I plan on getting more of those tonight. It was sunny and warm yesterday, and Mom spent it doing stuff around the house. First she made her lunches for the week, Then she did stuff around the house. She replaced the screen on the porch door. It is special "cat proof" screen. Even if I were to climb on it, I can't rip it, so it keeps me safe. Mom also took down the planter box (which was falling apart) and replaced the hummingbird feeder, which was broken. The Calla Lily is up on a stand where I can't reach it (and I'm not interested in it anyway.) As you can see Mom also rearranged the porch furniture. Since I don't like it when she sits between me and the door, she moved my new cat hammick so I have a safe exit. Of course, that doesn't mean I'll use it. She thought there was nice dirt there, but she was wrong. She had to remove that plastic stuff under the old mulch, and the two big bins sitting on that pallet. The she had to move three big bunches of day-lilies that were growing there. Mom can't plant her garden right up against the house, so she moved rocks. A landscaping company will be taking away the old mulch, tilling the ground underneath, and putting in several "yards" of good dirt. THEN Mom can plant the special plants she bought for this space. So, MOM is the one who is sore. Not me. Mom is going to get up early today and work in the garden. She is going to move some rocks. No, I do not get it either, but if I do not post now, I won't get a chance to post until Sunday. Oh well. Anyway, this is a Calla Lilly Mom bought for the front porch. It's kinda pretty, if I do say so myself. I hacked up a hairball. It felt awful, but now I feel a little better. Mom has been giving me lots of scritches to help me feel better. See the crate over on the left? Mom put a nice soft pillow on top of it, and then a little aff-ghan, and I like napping on it. See the little stuffed fox? I made Mom put him IN the crate after these pictures were taken. Oh. My. Bast. Mom came home with a box last night. It was from my old friend, Dorfington Fish Stanley, of Forty Paws, in TexCats. and a black one for, well, um, for just because. The box had 'Nip in it, and it was all over the hammicks, and I confess I lost my composure for about forty two thousand six hundred fifty three seconds. Thank you Dofington Fish Stanley and Maw. I really love my new cat hammicks. You should hear it here in the morning. The birds sing up a storm. It's amazing. There was nothing like this at the old place. I can hear, and watch birds from so many places. From pretty much ANY spot in the house. Here I am watching several birds at once. It's pawesome. Lookit this! My very own pot of cat grass in front of the window. O my Bast, life doesn't get much better than that. Oh wait, when I get one of these filled with 'Nip it will be better. This is still pretty good. Thank you all for your concern for my safety. Mom knows there are animals out there who are bigger and meaner than me. She wants to keep me safe, and hey, I like the idea of staying in one piece too. 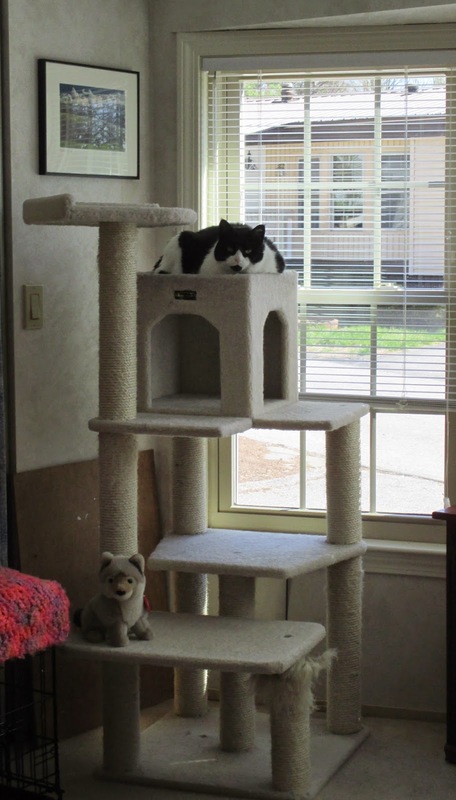 In the meantime I am enjoying my kitty condos, open windows and the nice warm weather we have been having here in New Hampster. Last night was warm, so Mom opened the front porch for me, and also opened some of the big windows in the studio. It was good. After dark, it is a good place to watch what is going on outside. Suddenly I saw something I did not like - an introoder. I raced off my kitty condo in the studio and ran the whole length of the house, onto the porch, and only the screen door stopped me. Mom was right behind me. I was hissing, but I jumped back into the house. Mom shut the door to the front porch. I was upset, and told her so. Apparently the screen on the screen door is old and was partially torn. When I ran into it, I made a hole. Mom was worried I could get through it and outside, so she closed the door to the porch. Later she found a piece of plexiglass, (Mom says it is plastic but clear like glass) and taped it over the part of the screen with the hole. Now I can go out there safely, but Mom has to replace the screen very soon. Mom says because we are out in "the country" there are lots of wild things around us, and and I am going to have to get used to that. After Mom comes inside from working on the garden, her shoes smell... interesting. It was 80F here yesterday, and as you can see, Mom opened one of the big windows in the studio. I was able to see and smell everything. It was pawsome. Then last night she opened the door to the porch, so I sat out there for a long time. It was good too! Sometimes I don't want to sit in the sun. It's sunny. It's warm. I'm napping. THIS is my own personal planter of Cat Grass. Hey Mom, put the flashy box down and go plant my 'Nip. Mom planted some seeds in little pots for her garden. She planted me some Cat Grass too. Mom says she will plant some 'Nip for me tomorrow, but she has to clean a pot first because my 'Nip might live inside and the pot has to look good. Mom says I will be very happy with it, and she says she has an idea for a special Cat Grass planter. I can't wait. She got more plants in a box yesterday, and they are outside waiting to be planted. We are going to have a terrific garden. AND... Mom will finally be able to go to the Evil Little Chocolate store so we can get the When When prize packages out on Monday!